Maine Wedding Photographer at the Atlantic Oceanside Hotel for the wedding of Ari and Doug. Their wedding was at a seaside estate in Bar Harbor, Maine. This image was from the wedding party as things were really starting to get fun. 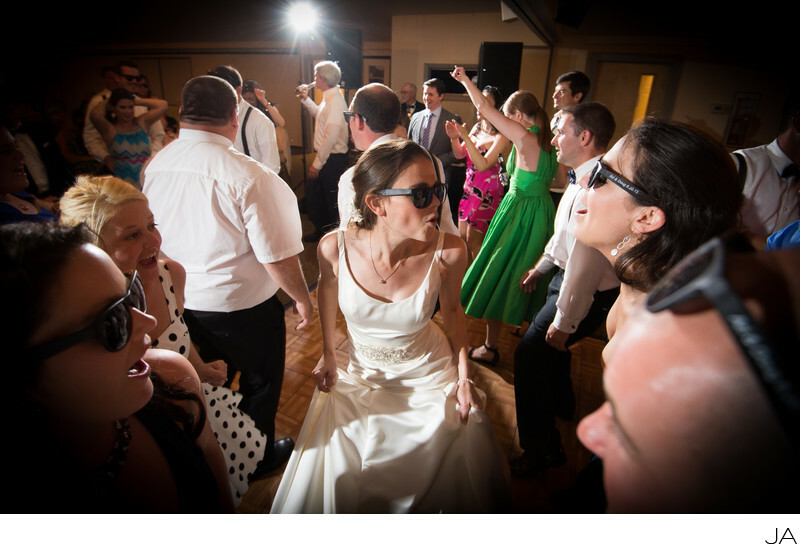 The party glasses were on, the music was playing and the bride was getting down with here girls in this fun image. Wedding receptions are loads of fun to photograph and one of my personal favorite times to capture fun, energetic shots candid shots. With the ceremony, speeches and major events completed, everyone is ready to party, including the photographer... me! This is where my wide angle lens comes out and I look for the best angles to capture the fun and excitement of the event. I always light the venue with three or more off camera flashes to create a vibe that is dynamic and looks exciting. My goal is to make the viewer feel the music in a still image. Here's one of my favorites from Ari and Doug's wedding at the reception hall at the Atlantic Oceanside Hotel in Bar Harbor, Maine. Location: The Atlantic Oceanside Hotel, Bar Harbor, Maine. Keywords: Ari and Doug (3), Atlantic Oceanside (3), Bar Harbor (6), Maine (69), Seaside (12), Wedding (51).